The Velocity Picking window will automatically be displayed when a new velocity picking is created. 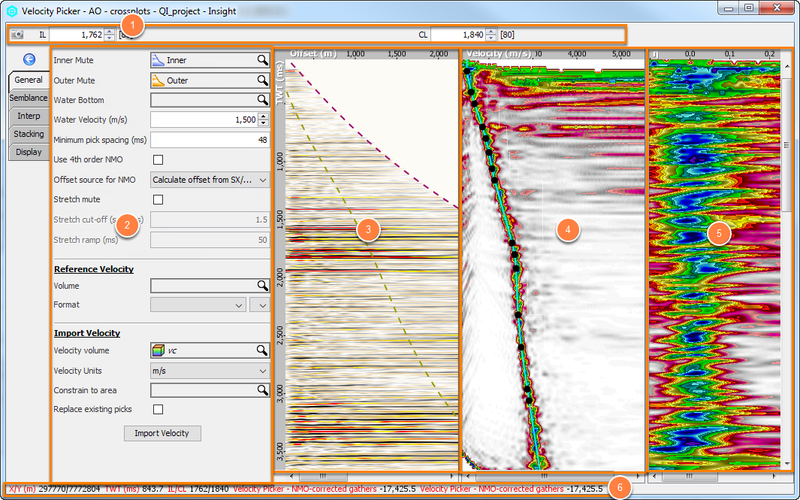 However, you can also open the window from the Tool menu or the Imaging tab. From the Control Panel, open the Tool menu. Select Velocity Picking and click on the velocity picks that you have created. The Velocity Picking window will be displayed. From the Imaging tab, right click on the velocity picks that you have created. Select Open Velocity Picking Window. The Velocity Picking window will be displayed. Control the inline and crossline from the navigation bar (see Navigation Bar in Views). The increments are shown beside the IL and CL in square brackets. Unlike other views, the increments here are fixed. You can adjust the increments by double-clicking on the velocity picking in the Insight Control Panel or right-clicking and selecting Configure Velocity Picking. Configure the General settings, Semblance, Interpolation, Stacking and Display via the tabs on the left. You can hide the Control Panel by clicking the left arrow icon or the tab that is currently opened to allow more screen space for the velocity picking display. To show the Control Panel again, click any tab or the right arrow icon. With the exception of the Display settings, all the settings in the other tabs will be disabled if you are not the owner of the velocity picking. 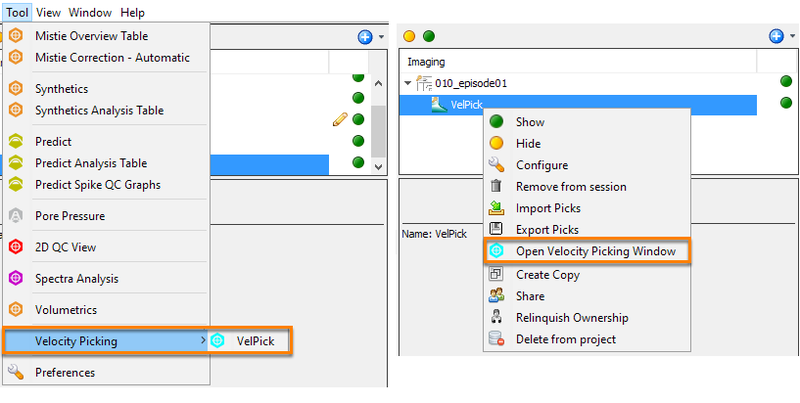 To take ownership, right click on the Velocity Picking in the Imaging tab of Insight's Control Panel and select Take Ownership or Create Copy (see Multi-user Considerations). This is where your NMO-corrected gather is displayed. The gather will update itself in real time as you pick your velocity. This is where you pick your velocity. Note: Semblance calculations are not affected by selecting 4th order NMO. By design, the semblance panel is computed with constant velocity, for which the Dix 4th order equation reduces to the 2nd order. This is where you pick eta values. This view will only be available if you have selected the Pick η (eta) check box when creating/configuring the velocity picking (see Create a Velocity Picking). The information bar at the bottom provides the location (time/depth, X/Y, inline/crossline and/or 2D line), values of the NMO-corrected gathers, and value of the velocity semblance at the location of the green crosshair. As you move your mouse pointer over the Gather View and Velocity View, the values will update to reflect the values at that location.